Whenever there is a long term project it is always good to take a step back and look how thing are going. Whether the plan is working or not, or there is need for some readjustment. As five weeks have now passed since I started my 77 day challenge I thought it’d be high time for a review. I thought I’d share it with you in the form of a little update. All in all I am pretty pleased with how things are going. I managed to follow the plan and do every workout session that was planned – except two. On those two days I came home from work resembling a limp broccoli with enough energy to fall into bed, but not much more. But two days in a five week plan, where I have 6 session per week is not bad. I now see that my plan is quite aggressive, but I seem to be bearing the weight. Honestly speaking I am quite enjoying it! With all this strength and energy inside we decided to try ourselves out. To make a test run, if you will. The first leg of the Hungarian Country Wide Blue Tour we did was on flat land. We wanted to see how we fared on a terrain that resembled our planned August tour. We set out on Saturday morning to Piliscsaba and from there uphill we went for the Piliscsaba railway station – Hűvösvölgy part of the tour. The 300 odd meter climb was tough. There never seemed to be an end to the road and it was only with the GPS that we saw that we were progressing. But we did have time and energy left to trick the other into thinking the crackling sound nearby was a wild boar. (Thankfully we did not encounter any!) 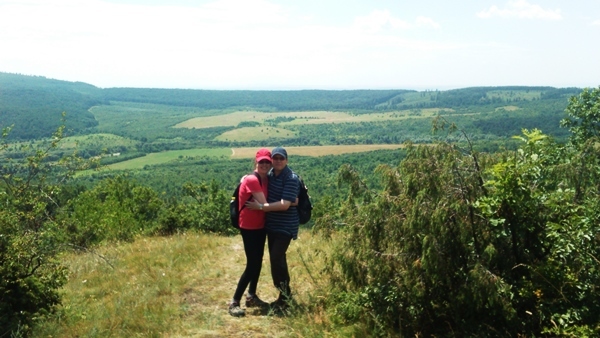 However, the highlight of the trip was when we arrived to the top of Nagy-Szénás, with its 550 meters the highest point in the Buda mountains. I was so happy! This was my first ever climb to a mountain top! I felt like I conquered not only this mountain, but myself as well. A couple of months ago I am absolutely certain I would not have been able to go up there. The sad part is, that coming down the mountain I suddenly felt this sharp pain in my shin. The pain slowly started to intensify to the point that we had to quit the tour 5 kilometers shy of the finish. I felt extremely disappointed, downright heart-broken. Looking back I now realize that I do have my limits. No matter how much I prepare, how much effort I put into it, I will have limits. I am not a superwoman, and honestly… I don’t wish to be one either. But, and this is perhaps the most important thing, I choose to think of my achievements rather than my failures. The 5 intense weeks of workouts that are the cherry on top of my days. The muscles I see, the strength I feel. The 15 kilometers I did finish of the tour, and the MY mountain, the one I conquered. This is the important thing. And the rest will just work itself out.